Tax Certificates – Are they worth the Investment? 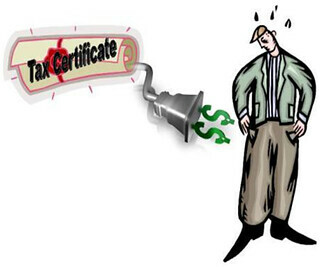 To answer the above question you must first know and understand what a tax certificate is. A tax certificate is a lien against a piece of real estate for any unpaid property taxes and any non-ad valorem assessments that may apply. The certificate holder pays the delinquent taxes, costs, charges, and interest the property owner hasn’t paid for a competitive bid rate of return on their investment. One of the benefits of investing in tax certificates is the guaranteed interest on your investment. In the state of Florida, the maximum interest rate on your investment is 18% per year, or 1.5% per month with a guaranteed 5% return regardless of how long you hold the certificate. Not everything about buying tax certificates is glorious. With most sales of tax certificates, payment is due at the time of purchase or within 3 days of the sale. If an investor fails to pay the full amount in the allotted time frame, their certificate will be cancelled. Also, failure to pay the full amount of the certificate could result in loss of deposit and could be barred from future sales. Another down side to tax certificates is the fact they could become worthless municipal liens and assessments placed on the property. Municipal liens and assessments on the property can increase so high that the property is considered worthless. Title Junction is a full service real estate title company serving the area of Fort Myers, Cape Coral and the entire state of Florida since 2005. The company handles a number of real estate title services for both commercial and residential properties. Employees of Title Junction can also act as a witness in courtesy closings as well as an escrow agent or a notary public. Posted on September 13, 2013, in Title and tagged Bonita Springs Title Company, Cape Coral Title Company, Estero Title Company, Fort Myers Title Company, Jennifer Ferri, Lee County Tax Collector, Non-Ad Valorem, Property Guiding, SWFL Real Estate, Tax Certificates, Title Insurance, Title Junction, Title Work. Bookmark the permalink. Leave a comment.